Affordable living with style in the East Vancouver real estate market is now available at Thind’s the Scena apartment residences. THIND Development is proud to introduce The Scena Vancouver condos, the latest achievement with the family of quality homes in East Vancouver real estate market. THIND Development has chosen the Scena apartment condos to be the signature landmark East Vancouver real estate development, complete with the extra attention to quality and detail you’ve come to expect and appreciate from THIND. They invite you to explore the latest East Vancouver The Scena Condo development that is truly setting the standard in affordability, and style. This is a THIND Signature Development. Don’t delay. Call today and speak with Fred or John for more information about the latest pre-construction East Vancouver The Scena condo residences today. Incredible pre-sale Vancouver condo pricing starting from just $219,900 and they are open Saturday and Sunday between 1:00 and 5:00pm or you can call for a private viewing. The urban Scena Condominiums are located at 2239 Kingsway East Vancouver real estate market and the Sales Office is at 2701 Kingsway. Good location plus high quality plus low prices means that the presale Vancouver Scena condos represent the best real estate investment that a homebuyer or investor can choose in this market. Good location: As you know, the three major attributes of a successful long term Vancouver rela estate investment are location, location and location again. The Scena Vancouver East condos for sale is conveniently located in the heart of the city at Kingsway and Nanaimo and is close to major public transportation routes, shopping, schools and tonnes of recreation just outside your door step. High Quality: At Thind Developers, quality craftsmanship, soild value and the desire to create an East Vancouver home for sale that you can be proud of is the ultimate goal. From the luxurious bathrooms to the granite countertops and stainless steel appliances, or the custom lighting and gorgeous laminate wood floors, you can see the quality absolutely everwhere at these presale Scena Vancouver condos for sale. Low Prices: nothing else beats the pre-construction Vancouver condo pricing at The Scena by Thind Developers. Studios start from $199,000, one bedroom plus den from $219,900, two bedroom from $289,900 and three bedroom The Scena Vancouver condos for sale start from $358,900. There are also thirteen Scena Vancouver commercial units available from $328,800. The Grand Opening of the East Vancovuer Scena condos is happening November 7, 2009 (Saturday from 12 to 6pm) at 2701 Kingsway. The site address of The Scena Vancouver condos is at 2239 Kingsway. 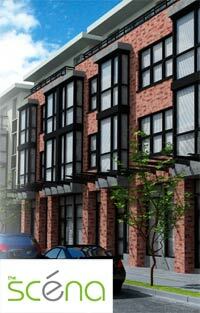 The Scena apartment condos are located in the heart of the East Vancouver real estate market. THIND Development is now proud to present the new homes here in the East Van Scena apartments which wil provide affordable and well located homes for a wide variety of people and lifestyles. From one and two bedroom plus den floor plans to two bedroom two level townhomes, the urban Scena East Vancouver condos are definitely a landmark property development that will transform the area into a bustling neighbourhood with new homes and retail. This latest development by THIND is a Signature Project that will offer affordable East Vancouver condo living at its best. As with any other THIND Development, the East Vancouver Scena pre-construction condos for sale have quality craftsmanship and a well thought out plan for construction, creating long term value for homebuyers. In addition, with any new THIND real estate development, the pre-construction East Vancouver apartments for sale at The Scena will come with the National Home Warranty to protect your home investment. Custom craftsman homes are waiting for you here at urban The Scena in East Vancouver. From the personal custom touches to the contemporary finishing, the urban condos for sale here at The Scena are superbly laid out and finished with many great standard features included with your purchase price. In addition to granite and stainless steel finishing, there are also custom lighting packages and beautiful laminate flooring in all suites. From form and fuction, you can’t fault the new THIND Scena Condos in the East Vancouver real estate market now being offered with quality and sophisticated living spaces. Offering some of the best value in East Vancouver real estate market, The Scena apartments for sale are true urban living spaces full of functional spaces, great location and vitality. Already under construction, the pre-sale Scena Vancouver apartments are concrete and steel condos and townhomes located on the most central road, Kingsway at Nanaimo. Style, character and true value are selling features for the new East Vancouver apartments at The Scena Condos. There are not many concrete low-rise buildings in the city, and this new and unique opportunity at The Scena Vancouver condos for sale present awesome value with very solid foundation, great design and an attractive exterior architecture. The best concrete condo value in town, these Scena East Vancouver apartments start from an incredible price point of just under two hundred and forty thousand dollars only for more than ¼ or all suites. 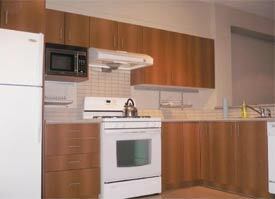 Junior two bedroom suites are less than $290k and three bedroom Scena East Van condos are from $385,900 only. Proximity to everything including grocers, entertainment, services and community amenities are within walking distance, which makes these East Vancouver condos so attractive. Also close by are public transportation routes and schools. Located at 2239 Kingsway, the presentation centre for the East Vancouver Scena apartments is located just down the street at 2701 Kingsway. Presented by Thind Development, the pre-sale Vancouver The Scena condos for sale feature all the little details that homebuyers are currently looking for including gourmet kitchens with stainless steel appliances, industrial goose neck faucets and plenty of cooking space with mini subway tiling backsplashes and track lighting for bright spaces. 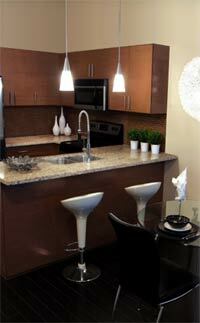 In addition, you have outdoor living spaces or enclosed balconies in addition to many views from most of the suites. The pre-sale East Vancouver Scena apartments also present great value for first time home buyers looking to purchase great real estate value in a starter condo home. As a signature development, these condominiums will not last very long and the grand opening is Saturday and Sunday open houses from one to five or you can also book a private appointment anytime. You’re going to love what THIND developments is offering! Whether you are looking for a Vancouver real estate investment or a family home, the pre-construction East Van Scena condos and City Homes will present spacious one, two and three bedroom CityHomes for sale. Some of these layouts and units at the East Vancouver Scena City homes for sale will include outstanding panoramic views of North Vancouver and the downtown skyline. Homebuyers can also choose to purchase two level townhomes that are perfect for multi floor living spaces. The urban townhomes at Scena East Vancouver will be solid reinforced concrete construction and will have convenient ground level access and spacious patios for outdoor living space too. When it comes to The Scena city homes, East Van home buyers can expect to find a mix of great location, affordability and awesome value, that is unparalleled by any other developer in the area. For those discriminating homebuyers who demand the best of all worlds, the urban City Home at the pre-sale East Vancouver The Scena condos wil have more than enough to enjoy and talk about when they purchase their new fashionable home. There are many of the Scena Vancouver city homes that are larger than nine hundred square feet and with some patios over 200 sq ft as well. 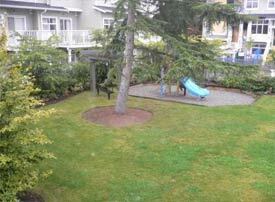 Looking for summertime entertainment space with sun and BBQ? Whatever you are looking for, the best urban East Vancouver real estate value is here at The Scena City Homes for sale. A great East Van location is awaiting you with close proximity to all transporation routes, shopping, dining and much more. For additional information about the newly released The Scena East Vancouver City Homes for sale, please contact VMG Project Marketing at 604.631.0838. Again, this is a THIND Development. For more information about the urban city homes and commercial space for lease, please visit www.thind.ca/thescena/. Not a whole lot of information has been released about the pre-construction Richmond Jasmine Lane Townhomes, but it is well worth taking a look at these two and three level townhomes for sale. Featuring spacious floor plans that include recreationl rooms, dens or studios, there are plenty of luxury finishing details as well here at the pre-sales Richmond Townhomes at Jasmine Lane real estate devleompent. These include radiant heating, laminate flooring, stainless steel appliances, gas fireplaces, built in vac systems and security systems, plus a very convenient location in Richmond real estate’s popular and ever evolving Richmond McLennan neighbourhood. Found at 6551 No. 4 Road, these new Richmond Jasmine Lane townhomes for sale are priced from just $459,900 (net GST is included). For more information about Jasmine Lane Richmond townhomes and to book your private viewing appointment, please do not hesitate to contact Bob at 604.273.2828 or you can visit the marketing webpage at www.bobsethi.com/jasminelane.html. The latest update on the Richmond Jasmine Lane townhomes for sale is that of the original 12 town houses, 8 were pre-sold by the developer. However, the remaining four pre-sale Richmond Jasmine Lane townhomes have been kept by the property developer as rental units, and therefore, have been taken off the market. At a later date, there is a possibility that the developer will release the final four Jasmine Lane Richmond townhomes for sale, but as of this time, there are no other Jasmine Lane townhouses on the property market. Please check back later for more details. Originally built by Polygon Homes, the Richmond Jasmine Lane townhomes were released not too long ago, so any re-sale properties will have the remaining 2/5/10 year home warranty, for your peace of mind. Most of the new Richmond townhouses for sale at the Jasmine Lane Polygon real estate development featured four bedrooms and 3.5 bathrooms in a spacious floor plan. In addition, most pre-sale Jasmine Lane Richmond homes for sale have two parking spots and 2 ensuites with lots of upgrades possible including drapes and blindes, views of the beautifully landscaped courtyard and much more. The contemporary homes here at the re-sale Richmond townhomes at Jasmine Lane will feature a club house with lush green spaces for relaxing and entertaining in addition to a fitness centre. The community in which these new Richmond townhomes are located is called McLennan North, a family friendly Richmond neighbourhood where you will find single family homes and a growing number of family style townhouses for sale. Close to schools and recreation and with low maintenance fees and large floor plans roughly between 1200 and 1800 square feet, these spectacular new Richmond Jasmine Lane homes for sale are now on the resale property market. Most of the Jasmine Lane townhouses are on Sillis Avenue, Richmond. Again, of the original 12 townhomes for sale, the developer sold 8 units during pre-sales and has kept 4 townhouses for rental properties. It is anticipated that after the one year leases, the developer will sell the remaining Jasmine Lane Richmond townhomes for sale, so please check back for updates. However, if you are looking to purchase in this McLennan North Richmond real estate district and are looking for family townhomes, there are currently a few re-sale Jasmine Lane homes as well as other comparable residences for sale around the $500,000 to $600,000 market and these prices include GST.